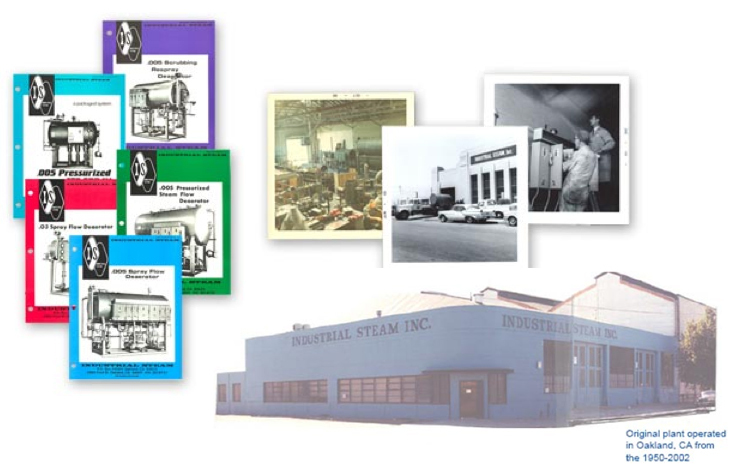 Industrial Steam was founded in Oakland, California in 1952 by Martin “Mike” Bekedam. As was common then, Mike was a self-taught engineer and electrician who had a flair for inventing and innovating, holding 16 patents. The first employee Mike would hire was Jim Williams. Over the years Jim learned the boiler business and became the chief engineer. Mike and Jim were experienced serving the large industrial market of Northern California that included wineries, tomato processing and meat processing facilities. In the early years, they custom built boilers, burners, deaerators and chemical feed systems. As the boiler industry began to consolidate, Industrial Steam’s focus shifted to deaerators. Through the years, Industrial Steam has been an innovator in the industry and an early adopter and pioneer of many new technologies. In 2002, Industrial Steam relocated its primary manufacturing facility to Atlantic, Iowa. Jim Williams just celebrated his 50th year with industrial steam and still works on a part-time basis.